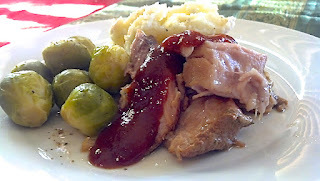 The last time I made my Stuffed Pork Loin, I only used half of the 6 pound cut of meat and froze the remaining portion. For a nice twist on Sunday dinner, I decided to mix up my typical cooking liquid combination and try a Rye Beer. I thought the Rye might add a nice pepper flavor without being overpowering. The resulting loin was moist and tender as well as perfectly seasoned with no dominant flavor overpowering the pork. As with most things in our house, we love it with warm Memphis BBQ sauce poured over the top to provide a little extra heat and sweet. 1. Combine all ingredients, except the loin, together in the crock pot. 2. Place the loin in the slow cooker. 3. Put the lid securely on the pot and cook on low for 6-7 hours. 4. Carefully remove from the slow cooker as it will be so tender, it literally falls apart. 5. Serve with warm BBQ sauce. I believe that in cooking, it is important to be adaptable when the recipe does not necessarily go as planned. This recipe was originally supposed to be granola breakfast bars; however, when they did not hold together firm enough, it was time to adapt. What does a crumbly granola bar become? Well, granola of course. This is a great granola because of its protein and fiber contents. I love it as a quick afternoon snack or in my yogurt for breakfast. With it being this easy, why would you want to buy it from the store? At least this way, you know what is going into what you eat. Plus, you can adapt it to your taste. Feel free to add additional dried fruits, honey instead of peanut butter, and even some chocolate! This particular recipe tastes like a peanut butter oatmeal cookie.....I am not going to complain!!!! 1. Place the oats on a baking sheet and toast for 10 minutes in a 350 degree oven. While the oats toast, prepare the wet ingredients. 2. Melt the butter in a microwave safe bowl for 45 seconds-1 minute. Add the peanut butter, 1/4 teaspoon cinnamon and 1 teaspoon vanilla to the HOT melted butter and stir until everything is melted and well blended. 3. 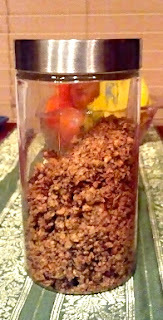 In a food processor, pulse the peanuts and raisins on high until finely chopped. You can be the judge of how big you want the pieces, but I went for a fine but coarse blend. 4. Combine the oats, wet ingredients, and peanuts/raisins in a large mixing bowl. Use a spoon or spatula to thoroughly coat the oats. 5. Reduce oven temperature to 300 degrees. 6. Prepare a 9x9 glass baking dish with non-stick canola spray. 7. Pour the oats mixture in the prepared baking dish. Use your fingers to press the mixture down and create an even layer. I have found that I need to either dampen my fingers with water or non-stick spray. 8. Bake at 300 degrees for 30 minutes. 9. Remove from the oven and allow to cool on the counter for 1 hour. 10. Using a fork, break the granola apart into chunks. 11. Spread on a baking sheet and sprinkle with remaining cinnamon and brown sugar. 12. Bake at 300 degrees for 15 minutes. Watch the oven closely after 10 minutes to prevent the brown sugar from burning. 13. 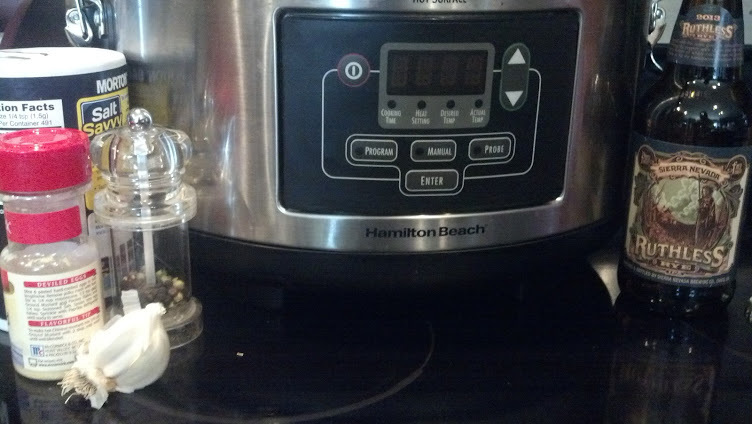 Allow to cool completely and then place an airtight container or sandwich bags. 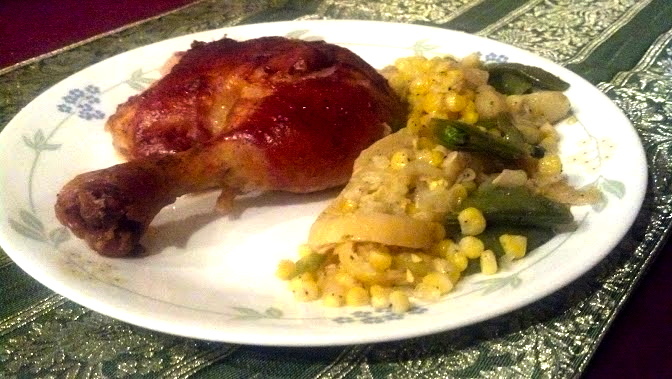 BBQ chicken is a quintessential Summer food in the South. We grill it, smoke it, and roast it. However, in the Winter, those options tend to be off-limits. I have found an even better option for succulent BBQ chicken, slow cooking in the oven! This recipe is great because I can throw it in the oven when I get home from work and in 2 hours have a great dinner. 1. In a small dish, combine the salt, garlic salt, black pepper and cayenne pepper. 2. Line the bottom of a roasting pan with the sliced onions and garlic cloves. 3. Place the chicken halves skin side up on the onions. 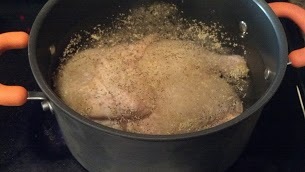 Rub each half with 1 Tablespoon mustard and then sprinkle with the dry seasoning. 4. Tightly cover with aluminum foil, making sure to seal the edges in order to capture the steam. 5. Cook for 1 hour 15 minutes. 6. Carefully remove the foil and spread each chicken half with BBQ sauce. I like a Texas or Chipotle style, but use your favorite. 7. Return the chicken to the oven for an additional 20 minutes. 8. Using a sharp knife, carefully cut between the breast and thigh joint to separate the upper and lower quarters. My husband loves stuffed meats. It can be chicken, pork, or beef, but he loves stuffing! I have recently found that I can accomplish the same flavor complexity of a stuffing without a bread binder. I enjoy the freshness of the mushrooms, onions and spinach in a meal; it seems to lighten the entire dish! 1. In a small skillet, melt 1 Tbs butter over medium heat. Add the onion, garlic, salt and pepper. Allow to sautee until tender, approximately 3-4 minutes. Pour into a medium mixing bowl. 2. Add the spinach and mushrooms to the onion mixture. Using a spatula, combine the ingredients. Set aside until ready to use. 3. Using a small paring knife, make a pouch in the middle of the porkchops. I like to go until about 1/4-inch from cutting through the meat. Use your fingers to stretch the interior to create a nice pocket for the stuffing. 4. Take half of the stuffing mixture and pack into each pork chop. 5. Melt the remaining butter in a skillet over medium heat. Place the stuffed chops into the pan and sprinkle with salt and pepper. 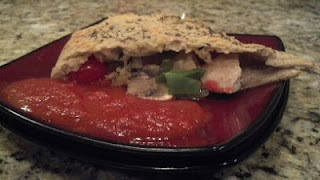 Cover with a tight fitting lid and allow to cook for 5 minutes. Turn the chops and cook for a remaining 4 minutes. Remove the cooked chops and set aside. ****NOTE: COOKING TIME WILL VARY DEPENDING ON THE EXACT THICKNESS OF YOUR PORK. IF YOU ARE UNSURE OF DONESS, CHECK WITH A MEAT THERMOMETER! 6. Add the water, mushrooms and butter to the pan and cook on medium high heat until slightly thickened. Add salt and pepper to taste. 7. Right before serving, add the chops back to the pan with the pan sauce and cover for 1-2 minutes to heat through. Spoon the sauce on the chops for serving. Saturday morning breakfast is one of my favorite meals of the week. 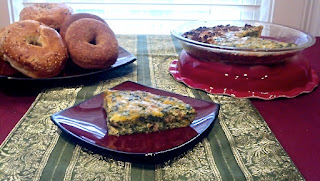 I love being able to slow down and make something different than the typical weekday quick grab that is breakfast in our household. 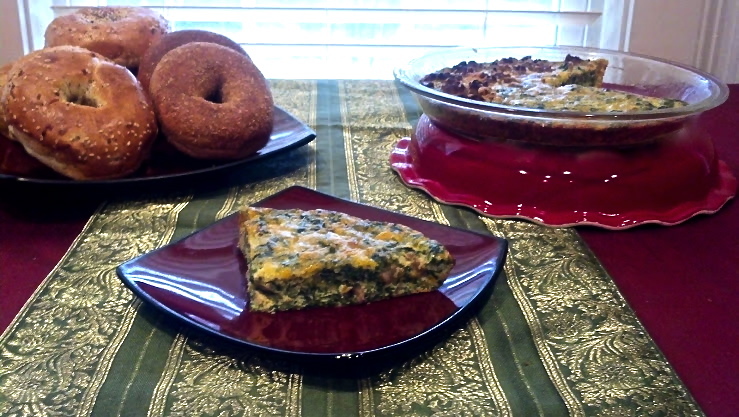 One of my favorite dishes, for any meal, is a nice spinach quiche, however, this morning, I do not want the crust. This dish is a hybrid between a quiche and a frittata. The sausage was added to half of the dish to make my carnivorous husband feel satisfied. Note, this is really about the technique. You can adapt the vegetables and meat to whatever you like. You could easily replace the sausage with ham or pancetta. The vegetables could go to peppers or even add a kick with jalapeño Once you have the basic idea, the possibilities are endless! 2. In a large bowl, whisk together the flour, salt, and pepper. Slowly add in the beaten eggs, whisking the entire time to prevent lumping. Add the milk, 3/4 cup cheese, and spinach. Stir until thoroughly combined. Set aside. 3. In a small skillet, melt the butter. Add the onions and mushrooms to the pan and cook on medium heat for 5 minutes, or until softened. Remove from the burner and allow to cool. While the onions and mushrooms are cooking, cook the sausage in another small skillet, making sure to crumble into small pieces. Allow to cool. 4. When the onions and mushrooms have cooled slightly, add to the egg mixture and stir to combine. 5. Pour the egg mixture into a 9-inch glass bottomed pie dish that has been rubbed with butter. 6. Top half of the dish with the crumbled sausage. Sprinkle the remaining 1/4 cup cheese over the entire dish. 7. Place in the oven and cook for 40 minutes until set and slightly golden. Note: If you want meat in the entire dish, TRIPLE the amount of sausage and stir into the mixture. Also, we do not eat much salt in my household, so, if you like things a little saltier, you might want to adjust the seasoning slightly. Looking for a great dish to have on hand for weekday lunches? Needing something a little different to serve at a luncheon? This quick, easy, and inexpensive recipe is just what you need. This was something my mama made all the time when I was growing up. I love to eat mine with a side of saltine crackers. 1. Bring a large pot of water to a boil. Place the pasta in the boiling water and allow to cook for 12 minutes, or until tender. Drain. 2. While the pasta cooks, prepare the remaining ingredients and place in a large bowl. 3. Pour the hot pasta into the bowl and stir until thoroughly combined. When you are growing up, you never think that there might come a time when your grandparents are not there. I have very fond memories of walking home from school with my brother and younger cousin only to be welcomed by a warm meal prepared by my Nana. She was a true Southern cook. I still remember exactly how the kitchen looked, where the secret stash of candy was hidden, and, most importantly, feeling safe and cared for inside her kitchen. The food was not only nourishment, but love. As I get older, I miss her more and more. It has been 16 years since I have been able to walk into Nana Handy's kitchen and share a meal with her. In order to feel her close to me, I turn to my own kitchen to prepare some of her recipes. I feel blessed enough to be the proud owner of her personal cookbook. Handwritten recipes remind me of her and her kitchen. One thing you need to know about my Nana Handy's recipes are that they are very humble and, typically, inexpensive. She was the mother of 7 children and had to be able to spread the budget in order to feed the large family. 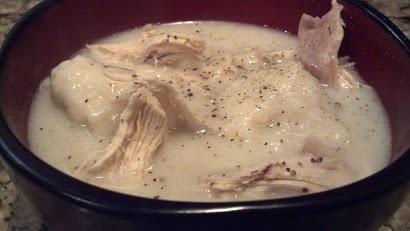 One such dish was her Chicken and Dumplings. Now, I have to tell you one major disclaimer; these ARE NOT the tough, noodle-like dumplings you might be used to.....can you tell I am not a fan of those type? These are pillowy, biscuit-based dumplings that melt in your mouth! This recipe is one I had to make from memory. As many of your may know, true cooks do not always write their recipes down. It is an artform, not always a science. However, these are pretty close to what I remember. So, tonight, my husband and I pay hommage to tradition and I remember my Nana Handy. 1. Place 5 cups of cold water in a large pot. Gently place the chicken half in the water, skin side up. Sprinkle with salt, pepper, and poultry seasoning. Cover and bring to boil. Reduce heat to medium and boil for 40 minutes. Remove the chicken from the pot with tongs and place on a baking sheet to cool. 2. Add 1 cup milk to the broth and bring to a gentle simmer over medium heat. 3. While the liquid is heating, mix together the dumplings. Add the shortening to the flour and, using your hands, gently cut the shortening into the flour until the size of peas. Slowly stream in the 1 cup milk while stirring with your hand. The mixture should be sticky but not runny. 4. Once the liquid comes to a simmer, add tablespoon size balls of dumpling batter to the pot. DO NOT STIR! Leave the dumplings to gently cook in the liquid for 10 minutes. 5. While the dumplings cook, remove the skin from the cooled chicken and begin to shred the chicken from the bones. Place the shredded chicken into a bowl until the dumplings are finished. 6. Right before serving, gently stir the pot of dumplings. At this point, you have to be very careful or your dumplings will fall apart. 7. To serve, place some of the dumplings in a bowl and top with shredded chicken. If you want to serve family style, as my Nana did, simply stir the chicken into the large pot and let everyone get their own. Note: I like to serve mine with extra black pepper. You will need to adjust salt and pepper to your taste as my family is not a fan of a lot of salt. Most peanut butter cookie recipes yield a very delicious result but the cookies themselves are dense and chewy. While I have not major aversion to such cookies, I recently decided to experiment and create a lighter textured, almost cake-like peanut butter cookie. The result was amazing! My husband's coworkers got to be my test-subjects; I was more than thrilled when one woman responded that it was "the best peanut butter cookie I have ever had!" Coming from the South, where peanut butter cookies are a childhood staple, I took this as a HUGE compliment!!! 1. In a large mixing bowl, combine margarine and sugars. Beat on high speed for 3-4 minutes until thoroughly creamed. 2. While the butter and sugars cream, combine flour, baking soda, and salt in a bowl. Set aside. 3. Once the butter mixture is creamed, add the 2 eggs, one at a time, mixing well after each addition. 4. Add the peanut butter and vanilla to the sugar mixture and mix on medium for 1 minute. 6. When the flour is combined with the wet ingredients, turn the mixer off and remove the paddle attachment. 7. 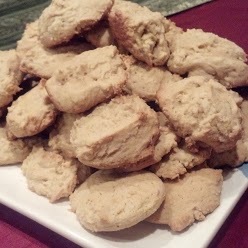 Place tablespoon scoops of batter onto ungreased baking sheets, leaving at least 1 inch between the cookies. 9. Remove from the oven and allow to cool on the pan for 2-3 minutes before removing. This is my go-to chili recipe. While it does require a few more ingredients than my Quick Chili, I feel that it is well worth the investment. 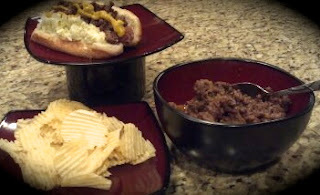 While the original recipe was developed as a condiment for hotdogs, I personally love to eat this as a sandwich, chili dog, and chili cheese nachos. Once you have homemade chili, you will never go back to the canned stuff! 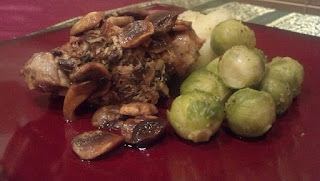 The leftovers, if there are any, freeze well for a quick weeknight dinner. 1. Combine onions, garlic, and ground beef in a large skillet over medium heat. Using a spatula, break the meat apart as it cooks. Sprinkle with salt and pepper. Allow the meat to brown and onions to soften, about 5 minutes. 2. Add the remaining ingredients. Stir to combine. 3. Cover and cook on medium-low for 20 minutes, stirring occasionally. NOTE: The longer you allow the chili to simmer, the better! If you have the time, turn it to low and let it cook for 1 hour. This will cause the chili to basically melt!!!! I am not sure if it is just a weird coincidence in my household, but my husband and I tend to differ on what we consider a good filling for a calzone. I love to have a mountain of vegetables accompanied by lean protein while my husband is a three topping man --- pepperoni, mushroom and cheese. While I can appreciate the peppery meat and savory flavor of his preferred calzone, I am very partial to the freshness of vegetables. This recipe was developed to satisfy both of our tastes. 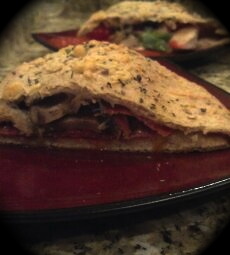 This is a great idea for a family pizza night; every chooses their fillings and makes their own pizza pocket! 1. In a small saucepan, heat the oil and garlic over low heat for 5 minutes. Remove from heat and allow to sit for 5 additional minutes. 2. On a lightly floured surface, cut the dough ball in half. Set one half aside. 3. Using the rolling pin, form a thin pizza crust, approximately an 8-inch diameter. Fill with desired toppings. For the Chicken and Veggie Delight: Layer the chicken, mushrooms, tomatoes, onions, peppers and half of the mozzarella on one half dough. USing a pastry brush, brush the opposite side of the pocket interior with garlic oil. For the Pepperoni Pocket: Layer half of the pepperoni on one side of the crust. 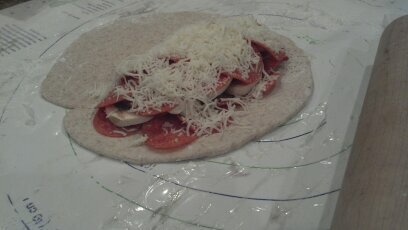 Then top with mushrooms, remaining pepperoni, and half of the mozzarella. Using a pastry brush, brush the opposite side of the pocket interior with garlic oil. 4. 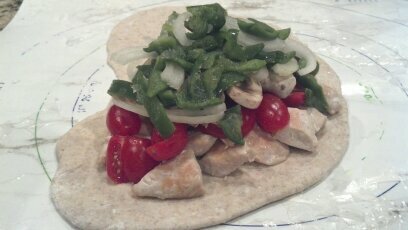 Carefully fold the unfilled half of the crust over to form a closed pocket. Using your fingers, gently crimp the edges together. Follow with the prongs of a fork to further seal the pocket. Move to a baking sheet that has been lightly sprayed with oil. Repeat for additional pockets. 5. Brush each calzone with more garlic oil and sprinkle with the parmesan cheese and Italian seasoning. 6. Bake in the middle of oven for 20 minutes. I like to serve mine with heated marinara sauce for dipping. My husband also likes some garlic butter as well! Sloppy Joe Sandwiches are a go-to in my family. We don't necessarily eat them often, but it is that recipe that you can always fall back on when in need. Another favorite, at least for my husband, is a Philly Cheese Steak. 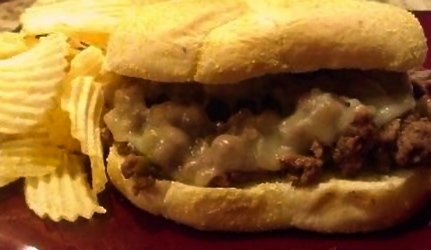 In order to satisfy both desires, Sloppy Philly Cheese Steak Sandwiches were created. This recipe utilizes ground black angus beef but can also be made using ground sirloin; either way, this is much more economical than traditional Philly Steak Sandwiches, and, more importantly, can be made in large quantities for a crowd. Make extra; it will go fast....and leftovers are great! 1. Using your hands, crumble the beef into a large skillet. Add the onion, bell pepper, salt, pepper and garlic powder. Cover with a lid and cook on medium heat, stirring occasionally, breaking the meat up more as it cooks. Continue cooking with the lid on the pan until the meat is browned and the onions are tender, approximately 10 minutes. 2. Stir the sauces into the meat, making sure to thoroughly distribute. Cover and reduce heat to low, simmering for 5 minutes. 3. Spoon meat onto a roll and top with a slice of cheese; I used Provolone. Place under a broiler for 30 seconds, or less, to melt. Top with the other half of the bun and enjoy! This is one of my husband's favorite game day treats. 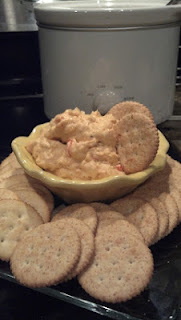 I have made this dip for tailgating using a camping oven and love it for parties as a slow cooker dip. I think you could also add some cooked shrimp to make this a seafood delight! You do need to know that this is not a chip dip; this is a thick dip, almost a spread, made for buttery crackers. 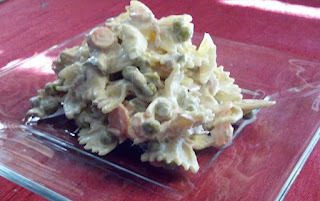 This recipe is so easy that you will add it to your entertaining recipe box for life! 1. Place all ingredients in your small slow cooker. Set the cooking dial to low. 2. Every 30 minutes, thoroughly stir the mixture. Allow to cook for 1 hour 30 minutes. 3. Turn dial to warm and enjoy! Note: You must turn the dial down to warm. If you leave it on low too long, the dip will get dried out. A great way to celebrate any game is with team designed cookies. 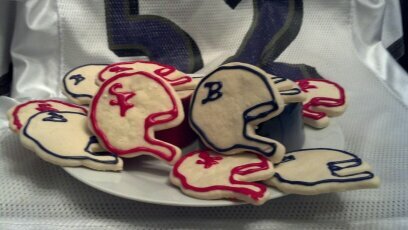 For Super Bowl XLVII, we are preparing for the battle of the 49ers and Ravens. These simple cookies make the festivities just a little more fun. Why go ordinary when you can add a little personalization to the party? This recipe is great for any occasion. The dough is slightly sweet, but not over the top. So take some time, prepare some batter, and make some cookies with your kids today. 1. Cream margarine and sugar in mixer fitted with a paddle attachment. Add the egg, milk, and vanilla; mix well. 2. Sprinkle the baking powder, salt, and 1 cup of flour into the mixer and slowly combine. Add the 2 additional cups of flour slowly to the mixer. 3. When the flour is combines, divide the dough in half and place each in plastic wrap. I squeeze mine into logs and twist the ends of the wrap. Note: I only needed half the dough so I double wrapped one of the logs and then placed into a freezer bag. You can freeze the dough for 3 months and just slice and bake the cookies when ready to eat. 5. After 1 hour, remove the dough from the refrigerator and roll out on a lightly floured board. Roll to 1/8-inch thickness. Cut with your favorite cookie cutter and place on a greased cookie sheet. 7. Allow to cool for 2 minutes before moving to a wire rack. WHILE THE COOKIES COOL, MIX THE FROSTING. 8. In a mixing bowl, whisk the sugar, vanilla, and salt. Slowly add the milk, adding just enough to get the consistency desired. Separate into bowls and create your different colors. 9. When the cookies are completely cooled, frost the cookies into your selected design.